Sleigh bells are no longer ringing, snow is well-past glistening, and the mere thought of walking through a winter wonderland has you worrying – way too early – about next year’s Christmas plans. 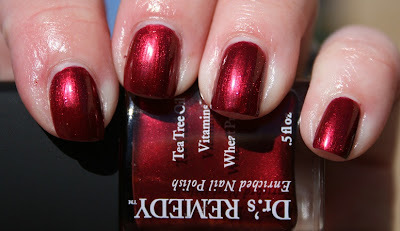 Enter some seasonal delight to make you sizzle (literally): Dr.’s REMEDY introduces four fabulous shades of Enriched Nail Polish, perfect to ring in 2011 and wear throughout the rest of winter (wonderfully). All swatches are two coats and applied beautifully. I think the standout is Revive Ruby Red- it's absolutely beautiful and applies perfectly. I absolutely love it. 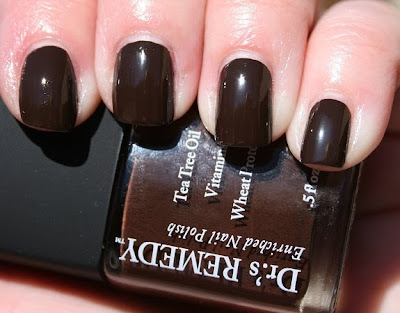 Dr.’s REMEDY Enriched Nail Polish is available for $16 online at www.remedynails.com or by calling 1-877-323-NAIL. Dr.’s REMEDY is a new line of doctor-inspired cosmetics that are dedicated to using clean, hypo-allergenic, anti-fungal ingredients. The birth-child of two New York-based podiatrists, Dr. Adam Cirlincione and Dr. William Spielfogel, Dr.’s REMEDY proves quintessentially-perfect for any person looking to better the condition of her skin and nails. Disclosure: These products were sent to me for review purposes by a PR firm. wow, I love the second one, and I have a similar one from O.P.I. And that was my favorite...anyway, actually, I love all nail polishes and the Nail Art.